Nows your chance to take part in the world's most aggressive sport. Teams from New South Wales, Queensland, Victoria and South Australia fight their way, in TWO completely separate games to the top of the tough AUSSIE leagues. Battle it out in the O.A.L. (OUTBACK AMATEUR LEAGUE) or flip the cassette over where more teams compete over an even tougher season to climb to the top of the V.E.L. 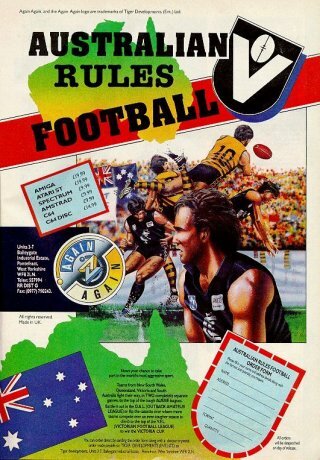 (VICTORIAN FOOTBALL LEAGUE) to win the VICTORIA CUP.